As I prepare for our trip to MEXICO (so excited), I have been thinking about all the things I need to remember to pack. Key word: remember. Or the things I need to buy before we jet off. 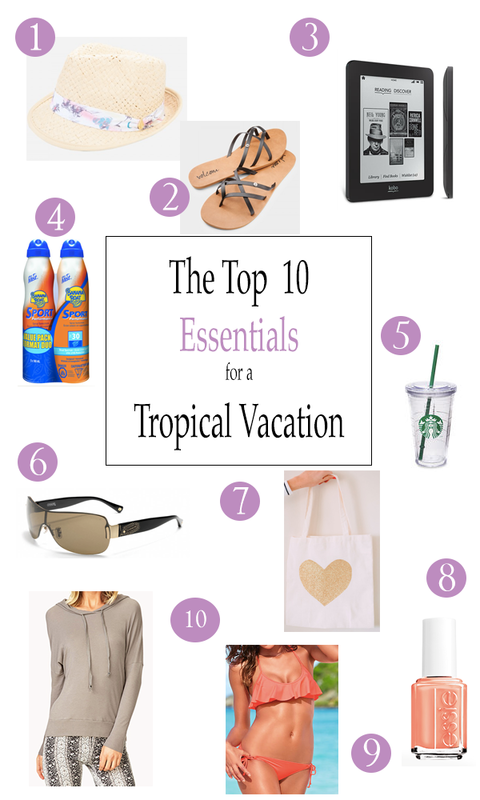 Here are my Top 10 Essentials for a Tropical Vacation. 1. A great hat- I love this one by Volcom, it is definitely tropical and super cute. Whether you choose a big floppy hate, or a regular old baseball cap having a hat to keep the sun off your head is a necessity. 2. Sandals - I love these Volcom flip flops, I bought the exact ones at an outlet store in Vegas last year and wore them almost every day last summer. I love, love, love them. So much so, I would be tempted to buy them in every colour. 3. eReader - My Kobo Mini comes with me everywhere! Including the beach. The mini is the perfect size for someone on the go, and it is a great price. I think I paid $50 for mine. It's so easy to load a variety of books to keep you entertained while laying out on the beach. 4. Sunscreen - I am terrible at putting sunscreen on. I usually choose a mist, like Banana Boat Mist, so I don't miss a spot. Trust me, I have had some very bad tan lines in the past, can you say one big hand print across my stomach? Yup. 7. A great tote bag - If your up to a DIY check out this cute tote from Style me Pretty. 8. A great nail colour - I am loving pastel colours lately, especially this colour from Essie. 9. Okay I don't know why this is so far down on the list, how can I forget having an amazing swim suit? Anyways, I love the styles from Victoria's Secret. Since the prices are pretty reasonable it makes it easy to buy trendy swim suits that may not be in the style next year. AND this colour matches the nail polish. 10. A light sweater - Like this one from Forever 21, because even on a tropical vacation it can still get chilly.